DXCJ120M3V INJECTION MACHINE is of high-speed, energy-saving models with: 5-point toggles clamping mechanism, clamping force from 80 tons to 480 tons, injection volume 113 grams to 2152 grams. M3 series IMM are equipped with CPC or MPC screen LCD controller with Chinese and English language. Screw and barrel can be freely selected as customers’ request. 1.For mold platen, we adopt high toughness ductile cast iron. Platens and toggles are processed by imported computer processing center and Flexible Manufacturing System, which ensures high precision and good interchange characteristic. 2.Use high toughness alloy steel to manufacture the tie bars that are chrome plated, which ensures long using life. 3.Equipped with detection high pressure lubrication device. 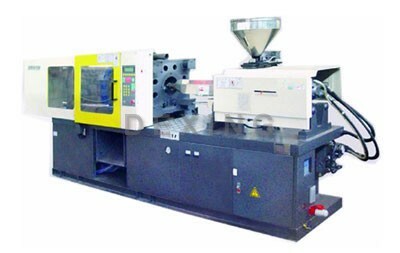 4.Multi-stage mold movement speed control and boost clamping ensures high efficiency and stability of the mechanism. 6.Equipped with electrical double protection for operation safety. 7.Hydraulic multi-ejection device. The ejection mode is optional on request to fit for the automatic production of a variety of molds. 8.Low Pressure clamping device for protecting the mold.